Is There an Ideal Weight for a Six Foot Male? Your weight is often an indication of your fitness level, and your healthy weight range is directly proportionate to your height. If you weigh too much for your frame, you could be at greater risk for heart disease, stroke and diabetes, according to the Centers for Disease Control and Prevention. Fortunately, your body mass index can help you easily determine the ideal weight for your height. You should aim for a BMI of 18.5 to 24.9, whether you're male or female. 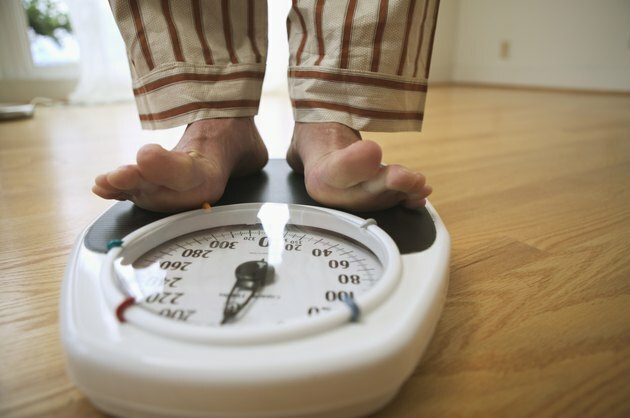 At 6 feet -- or 72 inches -- this means that your ideal weight range is about 140 to 183 pounds. However, it's still possible to fall in this range and have dangerous levels of body fat. You carry much of your fat around the middle, so measuring your waistline will give you a fuller picture. Men who have a waist circumference of greater than 40 inches probably have too much body fat, and are therefore at risk for obesity-related illnesses. Is There an Ideal Weight for a Body of 165 cm in Height? Is There an Ideal Weight for a 6'2" male? What Is a Healthy Weight for a 25-Year-Old Woman?